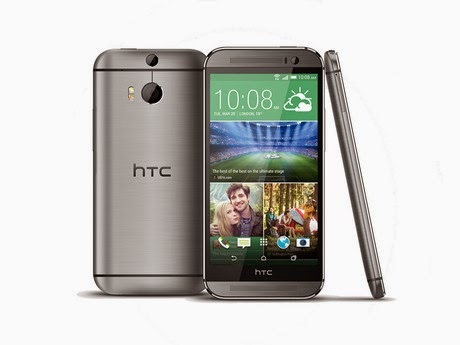 Over the past few weeks more and more reports and rumors have started to emerge surrounding the new and upcoming HTC One M9 smartphone for 2015. After a successful HTC One and HTC One M8 in 2014, the company is looking to built on that success with an all-new smartphone early next year. few times. We’re not yet sure if they’re the same device, but new reports today have reportedly confirmed the HTC Hima is real, and coming soon. Over the past two years HTC has delivered quality smartphones with the original HTC One, and then the HTC One M8 in 2014, and many expected something similar next year. Whether that will be the HTC Hima or something else remains to be seen, but the popular leakster @Upleaks has revealed more on the smartphone today over on Twitter. We’ve heard more than a few reports and rumors about the new HTC Hima already this year, most from @Upleaks, but today the leakster took to Twitter and shared what could be the most convincing details yet. 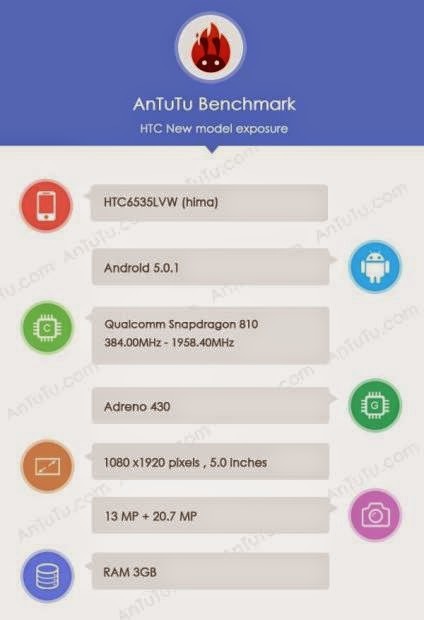 Posting a detailed screenshot from a popular benchmark application for Android reportedly showing the new HTC Hima specs, and confirming the device is headed to at least Verizon Wireless. The HTC One M8 arrived for most carriers in the United States, so its likely any successor will do the same in 2015. That said, seeing leaks first appear with Verizon on board is fairly new, so we’ll have to wait and see. Previous rumors are being confirmed from the leak and screenshot below, if accurate, confirming many key details about the upcoming Hima (likely the HTC One M9) that is set to be released in March of 2015. RAM, and get a serious boost to the camera. Listed as sporting a 20.7 megapixel camera, as well as a secondary 13 megapixel camera. This could be the same Duo camera on the rear which arrived on the HTC One M8, or simply a stunning rear camera and a 13 megapixel front camera for selfies, something that’s been popular lately with HTC. The screenshot lists the device as HTC6535LVW, and the “VW” at the end confirms at least one variant of the device will be on Verizon Wireless, but that’s about all we know thus far. This could be a flagship smartphone exclusive to Verizon Wireless in the United States, or just the carrier version of the HTC One M9 being tested by the manufacturer or HTC themselves. At this point its too early to tell what device is what, and if these leaks are even accurate, but we’ll be finding out more soon enough. The HTC One M8 leaked plenty in early 2014 before being released in March, and we’re expecting similar results this time around with whatever is next from HTC.